An iconic North American migration is in jeopardy. The monarch butterfly migrates back and forth from Mexico to Canada every year, its orange and black sails peppering blue skies. In the past 20 years, almost one billion monarchs have gone missing across North America. That’s about 1,000 acres, or 600 soccer fields of dead butterflies laid side by side. This abrupt drop in monarch numbers – estimated to be between 65% – 75% of the population – is causing scientists, policy makers and conversationalists in Canada, Mexico and United States to sound the alarm and take steps to reverse the decline. Monarchs are small organisms but mighty continental travelers with only one menu item for their hungry caterpillars: milkweed. All monarch larvae feed exclusively on members of the genus Asclepius which are common in disturbed, open habitat. Milkweeds are not viable forage for vertebrates as they contain heart toxins similar to ones used in digoxin heart medication. In the past, milkweed plants grew in areas where vast herds of buffalo traveled, churning up the Midwest soil as they moved; instead, today one sees mainly signs of human activity, such as fallow fields, roadsides and the banks of irrigation channels. 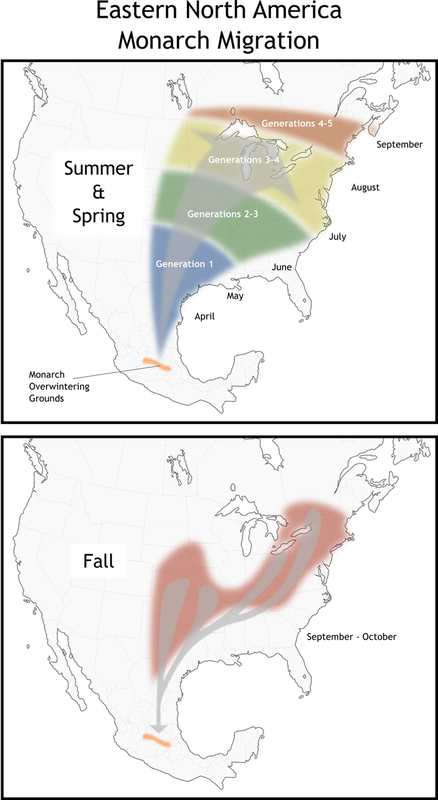 Unlike bird migrations, in which the same individual goes back and forth to breeding and wintering grounds, the monarch completes its eastern North American migration over multiple generations. Adult monarchs leave their overwintering grounds in the high elevation of central Mexico in late winter, fly north to Texas and lay eggs on emerging milkweed. These larvae develop into butterflies which fly north to the Midwest, laying more eggs along the way. The next generation of monarchs goes further north or stays locally if milkweeds are still available. Come fall after successive waves of northern movement, eastern monarch butterflies can be found from Ontario to Illinois and from Minnesota to Kansas, more or less. The fall generation then take to the skies when the environmental cues are right, riding the predominant air currents south towards Mexico. Monarchs who fed on milkweed as caterpillars in the Corn Belt are the most likely to return to Mexico. Upon arriving, they snuggle in for a long winters roost with millions of other monarchs on the boughs of pine trees until early spring. Many environmental factors affect eastern monarch populations and migration success, such as land use change, climate change, weather dynamics and disease. Of particular concern is the increased use of herbicides in association with herbicide-tolerant (HT) crops, a type of genetically modified organism. The expansion of HT corn into the Midwest over the past 10 years has been correlated with decreases in the number of monarch butterflies. HT modified crops can withstand the presence of glysophosate chemicals, unlike their unmodified neighbors which wither and die when the herbicide is applied. Around two million pounds – the equivalent weight of about 100 African elephants – of glysophosate herbicides are used in the United States between agricultural, residential and industrial needs every year. The application of these herbicides destroys habitat in another way for the monarchs. Corn fields have truly become monocultures as a consequence of these new farming techniques; they are devoid of weeds, such as milkweed, that help support a more biologically diverse community. Because of the intricacies of monarch migration, conservation is complicated. Coordinating three federal governments and numerous local officials is no small task. Mexico has been successful in recent years conserving land used by monarch overwintering populations, but their efforts are still threatened by dynamic weather changes and disease at these sites. 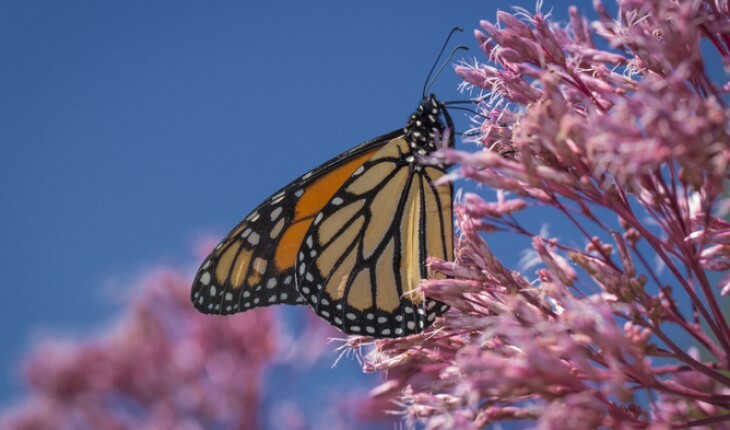 Eastern Canada is monitoring land use change and engaging citizen scientists to report monarch observations via the internet. 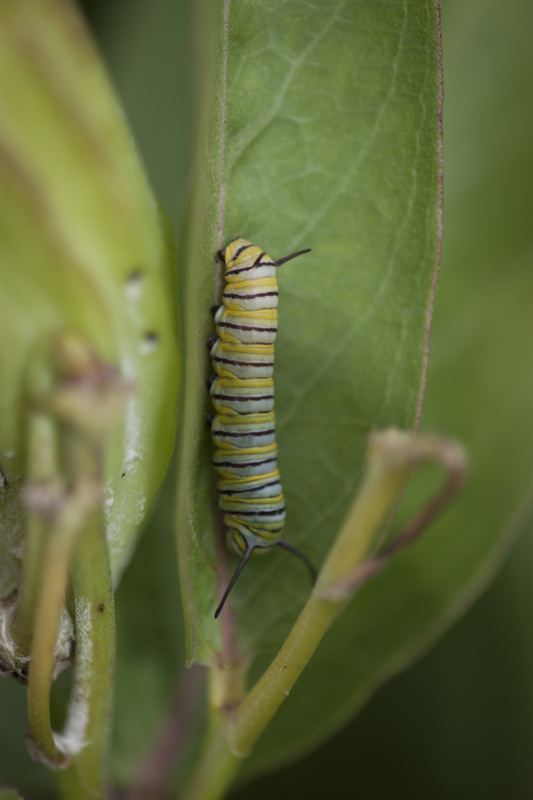 The US Fish and Wildlife Service launched an initiative this month to revitalize the milkweed population along the Interstate 35 migration route. These coordinated federal programs, while broad in scope, are still not enough to ensure eastern monarch survival. However, there are a number of non-governmental organizations and citizen-run programs contributing to help monarch migration. The National Wildlife Federation is offering milkweed seeds for anyone interested in planting them in their gardens, cities and suburbs. 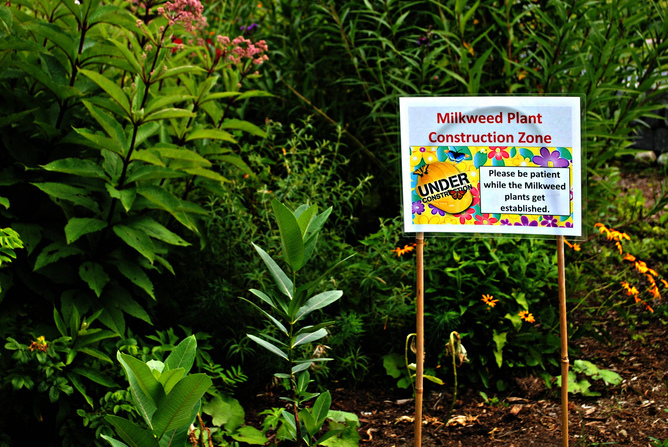 Demand for milkweed seeds will probably exceed supply in the near future. Concerned citizens could also donate to organizations with a track record for insect conservation such as the Xerces Society, write government officials in support of monarch conservation efforts, support farmers in developing better herbicide use strategies, and reduce or eliminate herbicide and pesticide usage in their own garden and local businesses. For adventurous spirits and nature lovers, there are options for joining citizen science ventures where you report when and where you see monarchs. Journey North, iNaturalist, and eButterfly, where I am co-director, all offer ways citizens can collect high-quality data useful for scientific discovery. 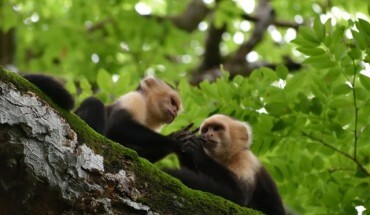 Recreational nature watching is on the rise, too, allowing people to enjoy the natural world while helping science and conservation. Tracking monarch butterflies – and planting milkweed – are ways that non-scientists can help restore what some people call the king of butterflies. Can science fiction really predict the future?